We are home from the trade show in Columbus, OH. Whew. That is always a busy 5 days of travel, setting up a 40 foot booth, visiting with shop owners, designers, publishers, booth tear down and wonderful dinners in nice restaurants! It is great to be home. We introduced a new design that was VERY well received. It's the Sock Stash Hoodie. It uses two strands of sock yarn...one of Mountain Colors Bearfoot in the main color and then 1 to 4 different colors of sock yarn from your stash. 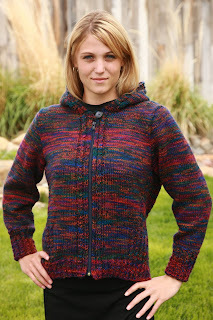 It has cute cabled ribbing and zips up the front. Be sure to check it out. Check out these latest additions on our website! What a beautiful sweater! I was hoping you would post it. Is the pattern available for purchase yet? And how many skeins of bearfoot does it take? I am just disappointed that you weren't at Black Sheep Gathering. I so would have bought Copper Mountain.